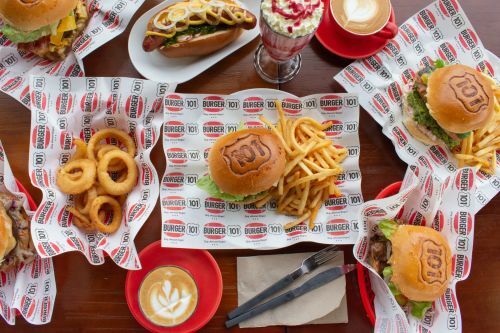 Menulog delivers for Burger 101 - Forrestfield so you'll be able to track your courier on a map. Bun free = superbowls and naked dogs loaded on crisp leaves and salad. 200g local beef, mustard, Burger 101 sauce, ketchup, pickles, lettuce, onion and tomato. Local beef, triple cheese, Burger 101 sauce, ketchup, pickles, lettuce, tomato and onion. Grilled thigh fillet, Swiss cheese, avocado, lettuce, Burger 101 sauce, tomato, onion and pickles. Chipotle pulled pork, grilled pineapple, slaw, tartare, onions, tomato, lettuce, pickles and smoky mayo. Pumpkin and chickpea burger, avocado, truffle mayo, slaw, lettuce, tomato, onion and pickles. Local beef, pate, Swiss cheese, avocado, truffle mayo, onions, tomato, pickles and lettuce. Local beef, hash brown, egg, bacon, Cheddar, tomato, lettuce, onion, pickles and smoky mayo. Buttermilk chicken (gluten free), chive fondue, avocado, lettuce, smoky mayo, tomato, onion and pickles. Local beef, waffle, chive fondue, bacon, pickles, lettuce, onion, tomato and Burger 101 sauce. Buttermilk chicken (gluten free), sriracha hot sauce, whipped blue, bacon, Cheddar, slaw, tomato, onion, lettuce, jalapeno pickles and Burger 101 sauce. Double beef, double triple cheese, crispy bacon, Burger 101 sauce, ketchup, pickles, tomato and onion. Local beef, mac and cheese, fries, bacon, Cheddar, pickles, lettuce, onion, tomato and Burger 101 sauce. Lentil patty, vegan cheese, vegan mayo, vegan pesto, avocado, tomato, lettuce, onion and pickle. Grilled salmon fillet, rocket leaves, sour cream avocado, mango salsa, cracked pepper, slaw and Burger 101 sauce. 8" Kransky, organic milk bun, lettuce, mustard, shaved Parmesan cheese, tomato, fried garlic and grilled onion. 8" Kransky, organic milk bun, chive fondue, slaw, mustard, onions, gherkin spread and Burger 101 sauce. Cabbage, carrots and creamy piccalilli dressing. Sriracha hot sauce, Burger 101 spice salt and creamy blue dipper. Chive fondue, bacon bits, pickles and Burger 101 sauce.